Food for Thought! : Hamara Bajaj: An iconic indian brand that caught eveyone's imaginations! Hamara Bajaj: An iconic indian brand that caught eveyone's imaginations! "Hamara Bajaj, Hamara Bajaj"...two generations grew up humming the jingle...It portrayed the Bulannd Bharat, strong and united India. It caught the imaginations of the aspiring middle class...joint families. I, as a kid really enjoyed the jingle but never realise the importance untill the announcement to stop the production of scooters by Bajaj. Oh! you mean to say the priyas and chetaks are all history now! Has the time changed so much...I have travelled almost every corner of my city, nagpur, with my dad on scooter, as a kid! The adv reminds me of those days. Launched in 1972, people use to wait for upto 15 years to become proud owners of a scooter. My dad got his first scooter after waiting for almost 4 years and yes, we were looked upon as a very cherished family. Owning a scooter in those days was among the sort after thing. People use to ask for Bajaj scooter as dowry, or if a bride's family is offering a scooter, they were highly regarded. The this generation kids would never understand the sentiments of Rahul Bajaj, when Rajiv Bajaj, the MD of Bajaj Auto announced to discontinue the production. Renowned Indian ad guru Alyque Padamsee came up with the slogan "Hamara Bajaj". It was like a nationalist movement. The words were on everyones mind. Everyone could relate to it. 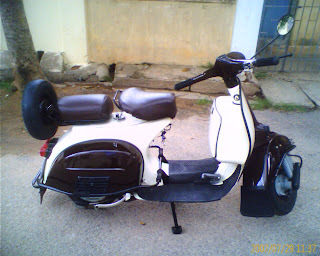 It was truely the style statement and youth of that time use to boast scooter with great pride. I wonder if there could be any vehicle or even any product worth waiting for 15 years!! !